Yang, who was involved in both Yahoo’s rise to Internet titan in the late 1990s and early 2000s and its fall from grace in the past six years, resigned effective Tuesday from all his posts at the company. Specifically, he quit his position on Yahoo’s board and on the boards of Yahoo Japan and Alibaba Group Holding, the company said in a statement. “My time at Yahoo, from its founding to the present, has encompassed some of the most exciting and rewarding experiences of my life. However, the time has come for me to pursue other interests outside of Yahoo,” Yang wrote in a letter to Board Chairman Roy Bostock. Yang also said in the letter that he is “enthusiastic” about the recent appointment of former PayPal President Scott Thompson as Yahoo CEO and about the company’s prospects for future success. “It’s sad, because Jerry has been such an institution in Silicon Valley for so long, but his exit gives Thompson the runway he needs to make decisions and not be second-guessed,” said Charlene Li, an Altimeter Group analyst, in a phone interview. Yang has been a towering figure at Yahoo, having been not only a co-founder but also CEO of the company. “It’s hard to operate in the shadows of someone like that. This departure really frees Scott to start with even more of a clean slate,” Li said. Yang’s exit may be the first of several others on the board, which has been criticized by shareholders and financial analysts who believe it is responsible for many of the company’s troubles, said industry analyst Greg Sterling of Sterling Market Intelligence. Gartner analyst Allen Weiner sees Yang’s departure as a vote of confidence, to an extent, that Yahoo is strong enough to succeed in the new digital world without his guidance. “Given its future as a digital media company, Yang’s lack of media expertise makes him somewhat of an unnecessary cog,” Weiner said via email. Regardless of the internal events that led to Yang’s exit, it will definitely play to those outside as a sign that Yahoo is embarking on a new beginning under its new CEO, the analysts said. 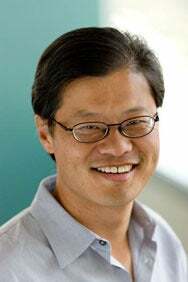 Yang co-founded Yahoo with David Filo in 1995, but Yang has historically been the most visible of the two. Filo remains with the company. The two launched Yahoo as one of the first Web directories and search engines. It evolved into a broad Web portal that provided online communications services such as email and a variety of content, such as news, finance information, entertainment content and the like. Yahoo ruled as a leading Web portal until the mid-2000s, when Google started gaining strength, thanks to its superior search engine, which would also give Google a dominant position in the large and profitable market for search advertising. Terry Semel, who had been Yahoo’s CEO since 2001, finally got fired in mid-2007. A shift in power from traditional portals such as Yahoo, AOL and Microsoft’s MSN to Google became evident, as a critical mass of Web surfers made Google the center of their online activities. At that point, Yang stepped in as CEO and pledged to lead Yahoo on a comeback, but about six months into his tenure as CEO he had to throw out his playbook in order to deal with a hostile takeover from Microsoft in early 2008. Microsoft’s attempt to buy Yahoo became a corporate soap opera that generated plenty of headlines in the first half of 2008, as Yang and the Yahoo board resisted the takeover, arguing at different points that Yahoo was worth more than what Microsoft was offering. Microsoft eventually gave up, after a final offer of about $47 billion went nowhere, but the months-long episode clearly sidetracked and distracted Yang and Yahoo’s staff in general. Yang, who had until then been a largely charismatic and well-liked figure, also emerged with a tarnished image, as some financial analysts and company shareholders blamed him for the failure of Microsoft’s attempted buyout. Months later, in January 2009, Yang stepped aside as CEO, handing over the reins to Carol Bartz. During her tenure, Yang remained largely backstage, making few public appearances. After the board fired Bartz last September, rumors swirled that Yang was trying to put together a group of investors to buy back the company and take it private. Although it’s still not clear whether Yahoo will remain in its current form, be taken private or be sold whole or in parts, the board last week picked PayPal’s Thompson as the permanent replacement for Bartz, a move viewed by some as an attempt to stabilize the company after months of uncertainty. In Tuesday’s statement, Chairman Bostock called Yang “a visionary and a pioneer” who has provided “unique strategic insights” to the board. “While I and the entire Board respect his decision, we will miss his remarkable perspective, vision and wise counsel. On behalf of the Board, we thank Jerry and wish him all the very best in his future endeavors,” Bostock said. As Thompson begins his tenure, Yahoo is viewed as a financially underperforming company that has lost its technology edge, resorting mainly to latching on to hot trends established by others, such as Google, Facebook, Twitter and Apple.